Alaska Airlines shocked everyone yesterday by announcing they would begin commercial service out of Paine Field in fall 2018. There will be 9 daily flights by Boeing 737 and Embraer 175 jets, presumably to major Western cities. But how does this fit into the overall strategy for the area, a strategy that includes Link to Paine Field? And how can flyers get there via transit? Serious discussions of flights here go back to at least 2008, and I first wrote about it in 2010. Local officials see limited growth prospects from Boeing, but a hub of expertise in various technical niches that has grown up around it. They look to that hub for job growth, while outside investors look for places that they can reach without a 2-hour cab ride. Both light rail to Seattle and SeaTac, and an airport no more than two hops away from most major world hubs, fit into that strategy. On the other hand, like most other communities Paine’s immediate neighbors resist the externalities of additional flights. Mukilteo figures therefore oppose the flights outright. Somewhat more removed officials, like Everett Council and Sound Transit Boardmember Paul Roberts, support commercial service but minimize the volume of flights that might occur someday. But it’s hard to believe that other airlines wouldn’t be interested, especially when Seatac faces capacity limits again. At the moment, only Everett Transit Route 12, an hourly circulator from Everett Mall, reaches this intersection. As luck would have it, in early 2019 the Swift Green Line will provide 12-minute headways (20-minute weekend/evening) there as well. Swift Green will connect with Swift Blue at SR99, and I-405 express buses at Canyon Park. Propeller Airports didn’t immediately respond to a question on plans, if any, to improve the pedestrian trip from BRT stop to passenger terminal. Seatac has been investing in improving the walk recently. Certainly, a half-mile walk should not be a huge deterrent to budget-conscious travelers. Another interesting question is the longer-term prospect for integration with the light rail spine in 2036, a time where flight volumes might be quite larger. When I asked him yesterday, Mr. Roberts “hadn’t given the issue much thought” and was far more concerned with ongoing assaults on Sound Transit in Olympia than tinkering with plans that won’t be finalized for years. The ST3 plan envisions a station at the Boeing Plant and a provisional one on SR99. Both would in practice require a transfer to Swift to use the terminal. If Paine remains a niche airport, that is enough. If not, and funding allows, it might be wise to (1) add at least a provisional station at 100th and (2) shift the elevated tracks as far as possible to the West to site said station optimally. But that will have to wait for the next stage of the planning process, and depends on fending off the legislature’s attempts to eliminate Sound Transit’s financial flexibility. The terminal plan includes a bus staging area and stop at the terminals door. If that’s the case, the contractor’s CEO didn’t bother to share that with me when I asked him. Where did you hear this? Might be something like QuickShuttle or Bellair Airporter. I would hope a major destination like this gets transit service to the front door. Even Moses Lake International Airport has a Grant transit bus stop on the drive in front of the departure doors. The Goodwill factor alone is worth the resources spent looping a bus through, especially one like SWIFT. An ST REX service connecting Downtown Everett and Seattle would be even better until Light Rail comes, but with 9 flights a day, other than employees I doubt you’d get many users of the stop, but nerveless its still important from a goodwill standpoint. I see your point, but it’s not just the monetary cost for the fuel to have bus loop through, it’s also a question of adding several minutes to all the passengers passing through, who aren’t even going to the airport. Jarett Walker gave a good post once, on why WTA doesn’t run a bus to Bellingham Airport. The argument is similar here. If you can afford a flight, you can afford an Uber ride from home (or the nearest ST express stop, depending on where you live). With respect, asdf2: A few extra minutes is not the end of the world. Also WTA finally got the message and cut a deal with the airport to bring WTA service close enough to the airport for an airport shuttle to pick up WTA passengers and take them to the terminal. I can provide hyperlinks if you want. Actually, I think people travelling make up a smaller percentage of the possible ridership, its more of a benefit for those who work at the airport to have easy access to the terminal facility for their jobs, not to mention those who want to schlep luggage onto the bus. MrZ is right (and Jarett Walker would agree) – if Paine Field becomes a major airport, people who work at the airport will likely be a larger share of the ridership than people catching flights. That said, connecting Paine to Seattle via a 1-seat ride is what makes Paine compelling as major airport if/when SeaTac has capacity issues. It’s worth noting that the .4 mile walk from the future Swift Green Line stops at Airport Road & 100th St SW to the gates at Paine Field — is roughly the same distance from the SeaTac/Airport Link station to the gates at Sea–Tac Airport. 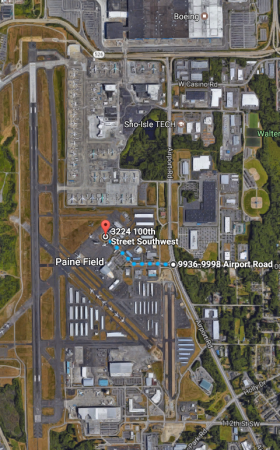 The Paine Field plans include a walking path from the bus stop to the terminal. That said, any amenities along that walkway (like an awning, signage, and landscaping) would be welcome. What are the conditions of the 0.4 mile walk? It it decently wide and decently separated from the road, or is it a 3-foot sidewalk immediately adjacent to 50 mph car traffic. I hope for the former and fear the latter. Also, what’s the elevation like. Steep hills can be a major deterrent for those with luggage to carry. Let’s say Paine Field ends up with 100~200 flights a day. For reference, SeaTac is >1,000, and Bellingham is ~175. Is it worth building an additional station to serve that amount of volume? Or is it better to just have a bus shuttle from the Boeing factory station to the terminal? I think incorporating a provisional station at 100th is an easy decision because we haven’t yet started design. I’m more wondering, at what passenger volume does it become worth it to spend the money to actually build the infill station, vs. just running a bus? My impression was that the Boeing factory station is going to need a shuttle bus to get workers to the Boeing factories anyways, so maybe they could just move that station closer to the terminal? FYI, Bellingham Airport has no bus service and never has. Currently, the closest stop is 1/4 mile away, on a route that runs every 60 minutes with no evening service. Bellingham Airport is in the fringe of the city in a low density light industrial area, and the airport itself is on a dead end road. So, once an hour 1/4 mile away is about what an airport that size can support for transit. Paine will likely have about the same traffic as Bellingham BUT, unlike Bellingham, Paine is not on a dead end road. While Paine itself won’t justify much service, great service can be provided by stopping at Paine on the way to someplace else, like Boeing. Extending Swift Green to downtown Everett would be a great improvement to current plans. Quick Shuttle stops at BLI, but ridiculously only Canadians are allowed to get on/off there. Those coming from Seattle have to continue to Vancouver. Bolt Bus stops at Cordata, which is a cheapish cab ride to BLI. But yeah, access is poor. Why anyone coming from Seattle would take a bus all the way to Bellingham to catch a plane is beyond me? Anywhere you can fly to from Bellingham, you can fly to from SeaTac, with many more schedule options, and probably a cheaper airfare as well. Vancouver, I can see, if you’re flying to somewhere in the United States and the border crossing line is shorter along I-5 than at the airport. But, Seattle – no. According to the Seattle Times article this morning there will be only 2 gates and taking into account the turnaround time it would mean about 16 flights per day. In addition they will limit commercial flights between 7 am and 6 pm so with that in mind there will not be a large amount of flights in and out of Paine Field. Not saying it may not happen in the future but at least not in the beginning. Considering that there is almost no bus service to the area except for peak-only service, which is highly targeted to Boeing work times (~6am, ~2pm), Link there makes exactly zero sense without a commercial airport. Even then, one has to carefully weigh the pros and cons of diverting traffic from downtown Everett for everyone, all for what is currently adequately served often by two trips on buses from far-flung areas. It’s not enough to say that it’s an employment hub. A commercial airport? Then maybe. I’d prefer ST to fund an intra-airport connector like SeaTac has, that just extends all the way to highway 99 to Link. But the decision not surprising given that ST’s tendency to build ADHD-like routes to places like Federal Way. AlexKven, while I agree with your assessment of the diversion, that ship has (more or less) sailed. The goal now should be to maximize the benefit of the detour. Is the maximum benefit likely to involve even further delay for people coming from further north (or heading to downtown Everett from the south) or serving the few people who would want to take one-stop transit to fly from Paine Field? I cannot see the volumes at the airport justifying an additional investment in serving them compared to getting people between Lynnwood and Everett in either direction. Very surprised to see this actually happening. I thought the Nimby’s shut this idea down. Isn’t there still a chance that there is an uproar from the community on more flights? “Environmental Impact” lawsuits on the horizon? Or are the Mukilteo neighbors just happy that they don’t need to drive all the way to SeaTac and they are going to let this happen? You say NIMBY like it’s a bad thing. When the first scheduled flight goes over my house, I lose $100,000 in property value. Mukilteo will lose millions in property tax revenue. All so an airline can make more money? How is that equitable? Hey Joe, as you know there’s right around 300 flights a day that leave Paine field right now. Explain to us how your property value goes down when one commercial plane flies over again… Alaska Airlines planes are much smaller than the Dreamlifter which rattles my windows when it goes over already. I’m a skeptic about Paine’s viability as a commercial airport, but this comment is singularly appalling. When you bought a house you made an investment. Investments contain risk. The notion that third parties should be obligated to make you whole if circumstances change in a manner that reduces your ROI on an investment is absurd. Yes, on this website we generally use NIMBY as a negative term…. You chose to buy a home under an airport flight path. WTF I doubt your house predates the airport. No they’re not happy but big money and government won the day. I know their plan is to start with Alaska Airlines and E175s / 737s, but Paine is an interesting case where a secondary airport could conceivably handle wide body long-distance flights from Day 1. It surely isn’t lacking in runway capacity, after all! Norwegian Air Shuttle to Oslo or Stockholm, anyone? So… would the plan be to fly people from Seatac to Paine Field just so some international flights can use the excess runway? That seems like an exceptionally wasteful use of carbon emissions. Don’t some small European city airports near larger metro areas fill the same function that Zach suggests for Paine Field? After all, you don’t have to fly people from Seatac to Paine Field, the planes would arrive and depart at and from Paine Field only. If you really wanted to get from one airport to another, you would just take Link and SWIFT. A good initial comp in the States might be White Plaines airport (HPN). It’s too far if your trying to actually get to/from NYC, but it’s a great option is you live or work in Westchester County or CT. Service is basically just single aisle planes to all the major Eastern hubs (Philly, Chicago, Boston, ALT, etc.) but zero flights to NYC airports. It’s served by both major (United) and budget airlines. Of course, Paine Field is much, much bigger than HPN, so the growth prospected are completely different (Paine’s runway can handle 747 right now), but the terminal size and initial service patterns are a good reference point. Paine won’t get international flights until an international terminal is built – that’s a separate governmental step that probably won’t follow until commercial viability is proven. Here’s a guess about the schedule: 2/day each way to LA, Chicago, and Charleston and 3x to PDX. Fares will depend on quque space at Boeing maintenance. I.E., this service was not begun with YOU in mind dear reader. I can see why Boeing would want that, but unless they’re paying a whole lot of money, why would Alaska do it? I was away in Portland, then had 8 hours of public transportation (some on Amtrak Cascades) yesterday so I didn’t feel right responding until I got home and could add a few hyperlinks. First, I lobbied really hard to get Everett Transit & Community Transit to intervene and make damn sure the terminal area was transit-compliant. That’s now the case. Let me explain. I’m deeply concerned if this terminal goes beyond two gates and quiet small body jets, the airport is going to become a wedge issue in the Mukilteo Community. OLF Coupeville has divided Coupeville politically and economically; I’d hate to see the same in Mukilteo. There is also a legitimate fear of lost property values and increased burdens on a community that can’t afford without new revenue to maintain the roads its already got – and Mukilteo is an upper middle class community that folks have paid a substantial premium to live in close to the shore and this multipurpose airport. WTA’s Route 3​ will drop you off at a bus shelter on Bakerview Road near Airport Way. From there, you can call the Airport Shuttle at (360) 920-0252, for a short trip to the terminal. Catch Port of Bellingham’s Airport Shuttle outside of Baggage Claim. Let the driver know you’d like the WTA stop on Bakerview Road near Airport Way. Do I have to make reservations in advance? No. But when traveling TO the airport, you do need to call for the Airport Shuttle, once you reach our bus stop on Bakerview Road near Airport Way. Please call only once you have arrived at the bus stop. (360) 920-0252. What about connections to Bolt Bus, Amtrak, Greyhound or the Alaska State Ferry? Why doesn’t the bus go all the way to the airport? We’re currently exploring the demand for bus service to the airport. Until we know more, we’ll be serving it using an existing route—Route 3. In order for ​Route 3​ to make its other time points, we’re not able to make the full loop to the terminal. Figured some would want to know. I know this is a long comment, but here you go. (Not so) bold prediction: Commercial service will have long since abandoned Paine field by 2036. I have to disagree. For most people north of 520, Paine will be closer than SeaTac. Getting there will probably be equally hard/easy as SeaTac. But as a small airport, Paine will be much faster to get through, fewer crowds, etc… If flights are also cheaper, I see a winning proposition. Personally, I’d be much happier to fly out of Paine than SeaTac if getting there takes the same amount of time, getting through the airport is faster, and flights are cheaper. I’m sure many people will feel the same way. North of 520 to Everett is a pretty big market. Unless there are hundreds of flights a day, it is simply not worth it to deviate into an airport with HCT services. There’s just not enough riders, and there are negative impacts to anyone travelling through. I have planned bus routes to multiple, much bigger airports, and I can tell you, the market for this is slim. Politically, and for the “I would do this on my one flight a year” basis, it has support, but from a market based perspective, forgetaboutit. 1. Swift Green, less than 2 years from starting, is to run at 10 minute intervals, not 12 minute intervals. FYI, Swift Blue is to move to 10 minute intervals by then as well. 2. Select trips of the route #105 to/from Bothell, and crossing the Swift Blue line at 99/Airport Road, are beginning this September, 5 a.m.-8 a.m. and 1:45 p.m.-6 p.m., bi-directionally. It will also stop at 100th and Airport Road (its stops west of Mariner will closely mimic Swift Green). 3. This coverage will be going for 19 years before Link light rail is scheduled to be in the vicinity, which at this point has zero stops at the airport. Apparently, Councilmember Roberts hadn’t given “the airport” much thought, either, only the Boeing company.